It is necessary to understand the History involved in the creation of some of these stamps... so I will post some History Background taken from an old catalog.. and there We can see that even in those days , the world was already a small place.. 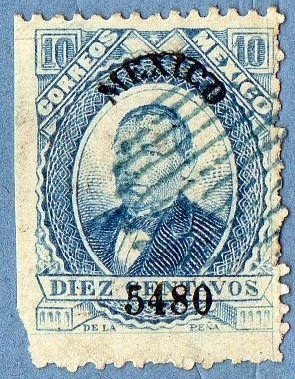 Here appears the first stamp I have to present .. and it is a stamp of the 1st Mexico President Benito Juarez..curiously it is in fine shape (except a small fault in the perforation..) and in General good condition..
You can see the Overprints of District and by the number presented we know that the stamp was issued in 1880.. one more time I 'm not certain if this is a Ultramarine blue or just another blue,..the fact is the Ultramarine variety , issued in 1880 is more valuable that the current blue one..
in the first 3 designs a Postal office Employee walk with the mail at his back..
two beautiful stamps , representing the Juanacatlán Falls and a view over the Popocatépetl mountain.. 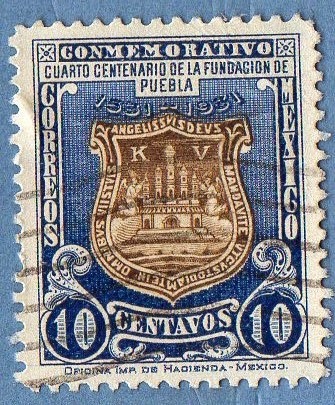 In the 1p stamp you can see the 'Handmade' Overprint with 'Oficial'... this series contains 4 different designs , the first with a coat of Arms, 2md and 3rd are presented and the 4th , a 5P stamp showing the Mexico city Cathedral..
weekly or monthly base ; it is a series again very perfectly designed and with beautiful frames.. 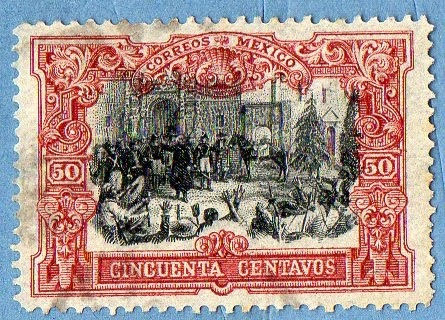 The last stamp presented show us Hidalgo declaring the Independence..
"On May 25 1911 , President Porfirio Diaz who had been a dictator since 1876, was forced by a Popular movement to resign, and the Liberal Francisco Madero succeeded him as President." 5th : simple 5c 1910 stamp with 'silver currency' Overprint..
8th : simple 5c 1910 stamp with brown (with better visibility...) 20c 'Barril' Surcharge.. The two varieties of the 1c stamp are presented and there could be or not some difference in the 20c stamp (between 'red brown' and 'rose lake'..) and the last stamp is the Black variety , and a 'grey brown' one exists too. The 5c Ultramarine Blue stamp is missing.. I hope that you all like this post and above all that Mexican Stamps could be one of your future Priorities..Really Good Classical and Semi-classical stamps...!